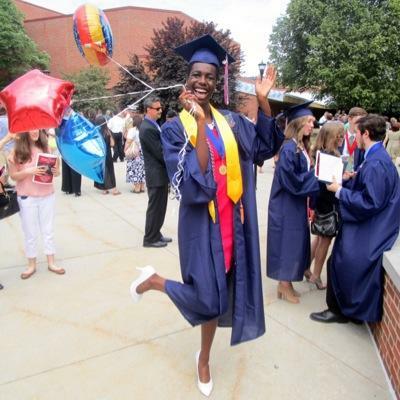 Rhonda Rogombe at her high school graduation. Rogombe’s story is not an isolated case, but represents a common predicament for students of color, whose obstacles range from access to experienced teachers and rigorous high school courses, to disproportionately harsh discipline and the availability of school counselors. This is the season of new beginnings. High school graduations, filled with proud parents clutching balloons and cell-phone cameras, mark the end of 12 years of education as young adults embark on an exciting new phase of life. Yet as we celebrate the completion of the race, we often give scant attention to the endurance and perseverance required to finish. This is particularly acute for black girls. When the emphasis is on crossing the finish line, we can overlook the unique struggle of black girls – how race, gender, and class combined create hurdles that can make their path to college a steeplechase. Research shows that encouragement and assistance from teachers and school counselors are critical as students of color pursue college admission. Those elements are frequently missing from black girls’ high school experience. They were indisputably missing from mine. A graduate of Girls’ High School, a public college-prep magnet school in Philadelphia, it was universally accepted that every student would go to college. As the oldest child of college-educated parents, it was universally accepted I would go to college. What was almost universally absent was the guidance to take “You’re going to college” from an ambition to a reality. A study of the Chicago Public Schools found 87 percent of black students aspired to college but only 65 percent had enrolled in a two- or four-year postsecondary program that fall. Most teachers are overwhelmed and college counselors are a vanishing breed. This condition is not exclusive to black girls. But we know that vital resources – help with navigating the financial aid labyrinth, and assistance with college essays and booking college visits – are scarce at schools with large black student populations. This is validated by Dr. Sara Goldrick-Rab, professor of educational policy studies at the University of Wisconsin-Madison who has studied and published on increasing college access for marginalized students. In black neighborhoods schools lack “the fundamental tools to get into college … we’re failing (black students) as educators, as support staff, as communities,” she explains, bolstered by a study examining gaps in college preparation. On key measures, such as the percentage of high schools with no counselor and student-to-counselor ratio, black students fare worse than peers in affluent, predominately white schools. Another piece of the puzzle is access to college-level courses. Black girls are more likely to attend segregated, high-poverty high schools where “a quarter…do not offer Algebra II; a third…do not offer chemistry,” putting the full range of college prep classes out of reach. The picture grows even more complex when coupled with the shortage of skilled, experienced teachers and teacher expectations. The role of educators in creating a college-going culture was “the single most consistent predictor of whether students took steps toward college enrollment ” in a two-year analysis of Chicago Public Schools students. In schools staffed primarily with novice teachers the expertise and support to untangle college funding choices and fill out college applications are severely lacking. And in schools with more seasoned staff black girls can still flounder. “As much as I thought I would be helped on those things, I was kind of clueless to FAFSA (Free Application for Federal Student Aid), financial aid, and scholarships” says Jerusa Nyakundi, 18, of Minneapolis. Black girls are also treated as problem children rather than encouraged to realize their potential, says Goldrick-Rab, and data bears this out. They are suspended six times more often than white girls, increasing their chances of dropping out – and even when they graduate, high school discipline records can pose a serious risk in transitioning to higher education. More targeted college planning and purging teacher bias are central to addressing the pervasive barriers black girls confront. In the Chicago study, researchers found an overwhelming majority of black students aspired to college – 87 percent – while only 65 percent had enrolled in a two- or four-year postsecondary program that fall. That’s an unconscionable number of unrealized dreams and aspirations. The first step is getting teachers to understand the importance of teacher expectations on student success. Can magnet programs lure affluent African-American families back to their neighborhood schools? Why are black students being paddled more in the public schools?